Raymore is a city located in Cass County and is known as one of the fastest growing cities in the State of Missouri. Raymore has plenty of tourist destinations and fun things to do. If you are looking for the best place to visit during your vacation, see to it that you put Raymore on top of your list because you’d never want to miss out on even a single thing in this area. If you are living in this beautiful place and want to spend your weekend strolling around the city, make sure to check your garage door to ensure the safety of your property. Trust A1 Garage Door Service. Contact us, and we will be at your area in the time scheduled to immediately get the job done efficiently. Who doesn’t want a perfect garage door project? Of course, everyone wanted to have that and luckily, here in Raymore, you can have the best garage door specialists who you can rely on in times when it matters. A1 Garage Door Service expert technicians can handle all types of both commercial and residential garage doors and even garage door openers. Our technicians underwent a rigorous training process required by the company for them to perform in the field only to perfection, ensuring that our customers will be satisfied with our work and product offers. We are a family-owned business, that’s why we treat every garage door like our own. We also ensure the safety and security of both employees and customers so we only hire experienced and skilled technicians. Because of this, we can assure you that you can give your absolute trust to A1 Garage Door Service when it comes to all of your garage door service needs. We guarantee nothing but satisfaction for you and happiness in our services. A1 Garage Door Service is the trusted provider of products that can give you high savings. We have incredible offers that you can enjoy everytime you hire us for your garage door service. When you call and book an appointment from us, the estimation and professional advice from our experts can be yours absolutely for FREE. No hidden charges and fees especially since A1 Garage Door Service is the most transparent garage door service company in the City of Raymore. We will give you options as well on our wide selection of promos, deals, and discounts that are only available to all the customers who will hire our services. We understand that it is hard for you to have a spare time to call a garage door specialist to inspect your garage door. With that in mind, we bring our service at your convenience. With just a phone call, you can get help from us even in the darkest hours or in the midst of a bad weather. If you need an emergency service, our line is open and our services are readily available to satisfy all of your garage door needs in Raymore. Contact us and book your appointment today! Is your garage door opener defective or simply not working? Call A1 Garage Door Service at 816-463-4100 and we will fix it for you. We have all the top models, brands and makes of garage door openers plus laser eyes and keypads. A1 Garage Door Service specializes in the installation, repair and maintenance of all commercial doors such as as security gates, roll-up garage doors, warehouse doors & more for local Tempe companies. Simply call us at 816-463-4100. Do you have a broken or bent garage door panel? Contact A1 Garage Door Service at 816-463-4100 and we will immediately replace or repair it. Always get the best torsion & extension springs. 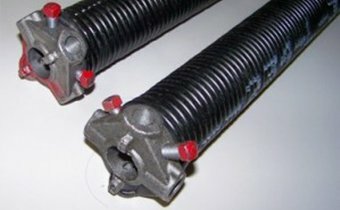 A1 Garage Door Service has an array of premium quality springs appropriate for your garage door. Just dial 816-463-4100 to get your door functioning like new. Do you have a damaged door? Worry no more. Our expert team at A1 Garage Door is well-equipped to fix it for you. Call us at 816-463-4100. A1 Garage Door Service can certainly take care of garage door cables, bad sprockets, and mis-shapen garage door tracks with ease. Contact 816-463-4100. Is your garage door loud? Is it lowering and raising slowly and gradually or even jumping on the tracks? Our technicians will make sure all of your components are in working condition and provide you with a full tune-up at reasonable prices. Just dial 816-463-4100. Are you in need of a brand-new garage door? Whether your home’s door is old and broken down or you want to update the visual appeal of your home with a custom garage door, our technicians will certainly give you the service you deserve at a good price. Simply contact 816-463-4100. Our specialists will install a brand new garage door weather seal which will keep rats, rain and dust away from your garage for good. Its simply a matter of calling A1 Garage Door Service at 816-463-4100.